Painting Acrylic on Canvas | 12" x 15"
My name is Chandrashekharayya Shiddayya Hiremath, known fondly as – Chandru. I was born in Radder-Naganur village in Naragund taluk of Gadag district in Karnataka on 15th July, 1980 to parents – Shiddayya and Ratnavva. Having no familial tradition of Arts running in my family, an interest in paintings came to me very early in childhood. Over the course of time, I was inspired by my art teacher at school who was very appreciative and encouraging of my talents. It seems to be God’s gift that quickly helped me develop and master my own unique style in depicting characters and landscapes on the paper. 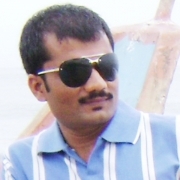 Academically, I completed my primary education in my birth place and higher secondary in Shirol, Naragund taluk. In 1997, I came to Gadag’s Vijay Fine Arts College to pursue a career in the Arts. There, I pursued the Arts Master (AM), Graduate Diploma (GD) and Bachelor of Fine Arts (BFA) courses respectively. Later, I joined Karnatak University, Dharwad for my MFA (Master of Fine Arts) and completed that in 2006. Being a humble son of the soil and completely in tune with the agrarian environment - village, festivals, rituals, fairs, traditions and practices, these influences have had a significant contribution to my works. My paintings are deeply inspired by the rustic life and over a period of time, I have developed a unique style of painting that I truly believe has blossomed through my incessant exposure to the environment. I have an inclination towards documenting my common rural activities and my academic art influences in my paintings. My repertoire mainly consists of miniatures and creative landscapes but also extends to other forms of depictions too. A frequent depiction in my paintings is cattle and livestock in various forms and styles; something that stems from my belief that ‘cows’ are divine and I find them endearing enough to portray them in moods of splendor across many of my works. The natural landscapes and earthly hues illustrate the earthly warmth and richness of culture. I developed an inimitable style while depicting agrarian settings in creative forms using motifs and forms that are extremely endearing and pleasing to the eye. I use acrylic colours and let them flow into line and brush effects that exemplify the character and bring the creation to life. I spend a lot of time thinking about the art forms and when I have read and gnawed on the idea for sometime, I spill them on the canvas with all the enthusiasm and spirit of youth. I think many art lovers would gladly chew into and digest the rich cultural connotations that I bring forth in my paintings. My painting exhibitions have come in for rave appreciation and comments; most talk is generated around my unusual fondness for cattle and their exuberant energy. I received a Gold Medal for Best Student in Vijay Kala Mandir, Gadag (Sponsored by Indian Art Group, Hubli in 2003), etc., and have exhibited my paintings in various forums and continue to do so. I have won numerous art awards in recognition of my talent such as the State Level Award (Srusti Art Gallery, Bangalore in 2011). My paintings were also selected for the Karnataka Lalit Kala Academy (Encouragement Award), Bangalore, in 2004 and the All India Art Exhibition (Art Mall New Delhi, 2012). My paintings have adorned the pages of Souvenir of 65th Annual National Conference of the India Psychiatric Society, Bangalore (ANCIPS) – 2013 where they display the rich heritage of Karnataka as well as reflect the prevalent mental health and psychosocial adversity and India Art Festival Mumbai in Neharu Art Centre-2016.